For those living in a magical land of candy, with orange-faced helpers to do their bidding, the ability to taste your words is nothing new. But for the rest of us, the ability to taste what you type in cocktail form is a novelty. [Morskoiboy] took some back-of-the-envelope ideas and made them into a real device that uses syringes as keys, and facilitates the injection of twenty-six different flavorings into a baseline liquid. He figures that you can make each letter as creative as you want to, like representing different alcohols with a letter (T for tequila) or matching them to colors (R for red). Check out the video after the break to see an ‘Any Word’ cocktail being mixed. 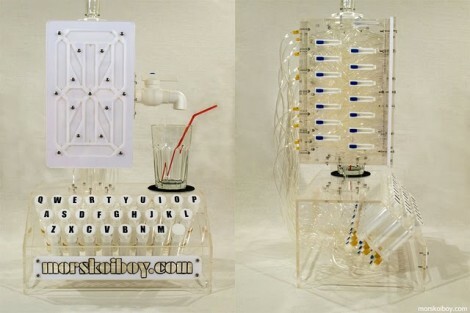 This setup is entirely mechanical, and makes us wonder if [Morskoiboy] works in the medical equipment design industry. Each letter for the keyboard is affixed to the plunger on a syringe. When depressed, they cause the liquid in an external vessel (not seen above) to travel through tubing until it fills the proper cavities on a 15-segment display to match the letter pressed. From there the additive is flushed out by the gravity-fed base liquid into the drinking glass. We can’t imagine the time that went into designing all of the plumbing! Maybe the coolest thing I’ve seen all day. I still don’t understand how that display works exactly, is that custom built or is there really a display like that out there? I’ve got to say, this is one of the coolest looking things I’ve seen in a long time. A nice improvement to this would be to spring load the syringes so they pop out again and refill themselves via 1 way valves and reservoirs under the table. Still, I can’t argue that this isn’t great. Very impressive design and build. Oh man, this has to be one of the coolest things ever! This is very very GOOD. Boy, that is very impressive. I don’t think I’d want to drink that stuff though… It looks like a watercolor brush rinsing jar. Balls, I retract previous comment and walk away red-faced. The preview via RSS really didn’t show this to be that amazing – I only loaded the video to see why they said the plumbing was crazy. I didn’t realise it showed you what letter you’d pushed…. just wow!